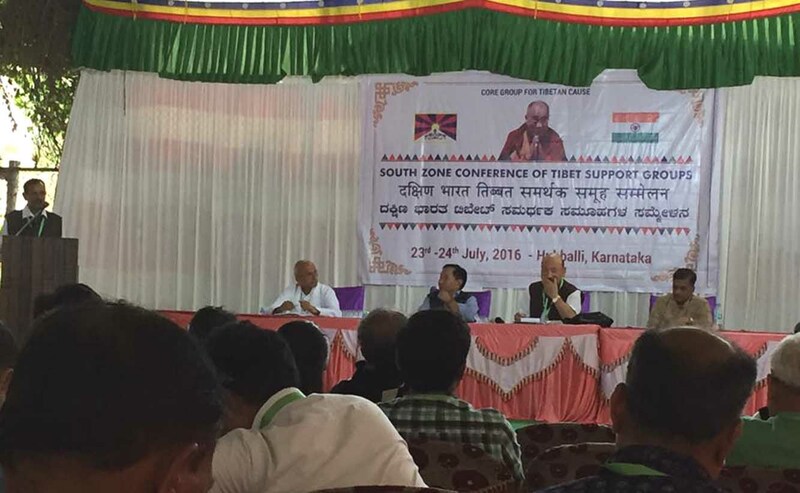 (TibetanReview.net, Jul27, 2016) – More than 60 people took part in a South Zone Tibet Groups conference held at Hubballi town of Karnataka state which was inaugurated on Jul 23. It was organized by the New Delhi-based Core Group for Tibetan Cause, an umbrella organization for Tibet support groups in India, and had Mr Prahlad Joshi, the Lok Sabha Member of Parliament from Dharwad city, as the chief guest. The participants represented Tibet Support Groups in the south Indian states of Kerala, Tamil Nadu, Andhra Pradesh and Karnataka. Mr Amrut Joshi, National Co-Convener of Core Group for Tibetan Cause, delivered the welcome address while Mr RK Khrimey, National Convener of the Core Group, gave the Introductory Remarks. Apart also from the chief guest, others who addressed the conference’s inaugural function included Dr B Tsering, principal of the Dalai Lama Institute for Higher Studies, Bengaluru, who felt that a lot more needed to be done to create grassroots awareness to make the Tibet movement in India stronger. The valedictory address was delivered by Mr JP Urs, Southern Region Convener of the Core group. A reception was held at the Gaden Jangtse Monastery in the Mundgod Tibetan Settlement for the participants who also visited the Drepung Loselling Monastery.